How one Metropolitan Museum got 500 New Members to Join in 10 Days! A local Museum of natural history is a world-class destination for visitors and researchers. For nearly a century it has served as an outstanding resource for public education and environmental conservation. Membership dollars support the Museum’s collections, its curators and their research, and educational programs that benefit one-quarter million visitors per year. The Museum had been seeing a decline in membership dollars in recent years and sought our help. A clear primary goal was established: sign up 800 new members. Secondary goals included (1) promote a new traveling exhibit, and (2) entice people to visit. Previous Direct Mail membership campaigns had yielded a fairly routine, 1% average return. This year a different tactic would be taken. Direct Mail would still be used, but the call to action would be made more fun, more attention- grabbing and more ‘irresistible’. Per our advice, the Museum opted to run an instant prize promotion using ‘Conceal & Reveal’ game cards. 50,000 total pieces were mailed. Each envelope included an application and a custom scratch-off. 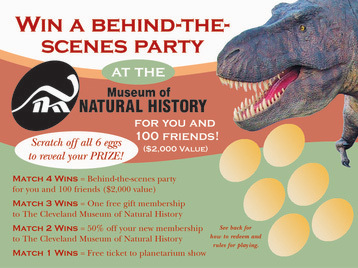 The scratch-off incorporated six dinosaur ‘eggs’ to be scratched and was tied to the chance to win great prizes – from free tickets, all the way up to a party at the Museum for a winner and up to 100 friends. Our Fun & Games division offers specialty printing and promotion services to help increase the SALES in sales promotions, the PERFORMANCE in performance programs and the FUNDS in fundraising programs. It works synergistically with the other divisions of our company to bring you RESULTS that exceed your expectations. To download a pdf of this case study, click here. Give us a call and we will help you with your customer’s next Scratch Off Promotion! « Direct Mail Still Rocks!